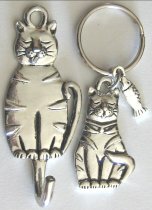 Here is a solid pewter key hook and key ring that were meant to go together. The key hook is 3 1/4" high x 1 1/4" wide. The hook sticks out 1/2". The key ring is 1 3/4" high x 1" wide. The ring is 1 1/8" in diameter. Because they are made of pewter they stand up to constant use and will not tarnish. Boxed set. 1 set left.